Thank you to everyone for attending the Annual General Meeting of the Rivers and Area Community Foundation Inc. on this cold night. How could 2017 have passed so quickly, including the 150th Birthday of Canada. We continued with the two strategic priorities we had set in June of 2014 which was the completion of a Public Daycare Facility and the Science Education – Wetland Centre of Excellence Project. Each was presented with its challenges because of provincial government program changes and we continue to support both of them. We continue to liase with our local MLA on the Daycare, as well as writing to the Premier showing our support for this much needed project. February saw the RACF website refreshed and a tutorial provided by Leech Printing to two of the board members. The publicity committee continues to update Facebook and place monthly articles in the local newspaper. March /April saw discussions begin about becoming an affiliate member of The Winnipeg Foundation and the Community Foundation of Canada – Canada 150 Community Fund grants. 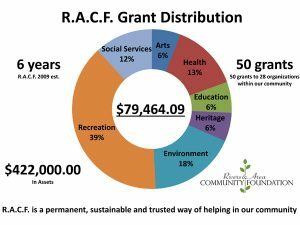 The RACF was given $5,000 for matching grants. There were three grant recipients who applied to the CFC Fund. These applications were sent to the Community Foundation of Canada to determine eligibility and then we were advised of the eligibility of each. The money was received from CFC and provided to the grant recipients, the Rivers Comets, the Royal Canadian Legion Branch #75 Ladies Auxiliary and Rivers Minor Hockey Girls team. They were to follow the criteria for reporting and advise the CFC of completion of their projects. We also saw the beginning of the Youth in Philanthropy group with Michelle McFadden taking the lead, supported by Donna Falkevitch. Teacher – Michelle Maxwell of the Rivers Collegiate is the representative from the school. May saw Michelle McFadden and Donna Morken attend the National Community Foundation of Canada Conference in Ottawa from May 11th – 13th. This was an amazing conference with over 39 countries from around the world taking part. The workshops were very educational and it is an opportunity to gather ideas about what other Foundations are doing. Michelle and Donna both heard guest speaker John Ralston Saul (whose father was a Base Commander here) and he has fond memories of Rivers. He signed his latest book for inclusion in our library, along with one written by the Governor General. Michelle placed the books in the library after our return. May also saw the RACF plan to deliver Maple Cookies to the students of both schools as Lieutenant Governor Filmon would be coming in June to celebrate the Rivers Train Stations’ 100 th birthday, to donate and plant a Manitoba Regal Celebration Maple tree. Planning for a Granting/Gala Fundraising evening the night before Endow Manitoba Day began, with an idea to have Kim McConnell as guest speaker. In June her Honor Lieutenant Governor Janice C. Filmon and his honour Gary Filmon attended the celebration of the Train Station’s 100th anniversary, as well as her Honour planting a special Canada 150 Regal Celebration Red Maple grown by Jeffries Nursery in Portage. Members of the board handed out Maple Cookies to the students at the presentations at Rivers Collegiate along with representation from the three levels of Government. July /August continued with the planning of the Gala Event and Grant Applications opened up September 1st. September 1st to 30th saw a time for the grant applications to be received and planning continued for the Gala. The Gala/Fundraising event is to be held in conjunction with Endow Manitoba Philanthropy Day on November 18th. The Gala will be held on November 17th, with all donations to the Endow Manitoba campaign. In October we saw our annual grant review and decision making meetings take place. This year we received grant application requests exceeding $300,000.00 for the 2017-2018 granting period. Twelve grants were given out totaling $16,500.00 for the community and area. Gala planning continued. For two days in November before the Gala, Jena Ratz owner of Black Tie events used her decorating talents to transform the Legion Hall. Then on the November 17th we held our 1st ever Granting/Fundraising Gala, with guest speaker Kim McConnell. Not only did Kim do an amazing job talking about “his story” but also about volunteers and giving back to communities. The Youth in Philanthropy group attended the gala and assisted with the entire evening. Director Craig Allison showed a PowerPoint about what Foundations are and how they assist communities. He further produced a PowerPoint showing all the grants and events the Foundation has participated in since its inception. It was with great pride that we announced, the Bill and Helen Sibbald Legacy Fund. It is a field of interest fund for Agriculture, Culture and Arts and the Environment with $25,000 being donated by Bill and Helen in their name. Helen was able to attend the evening and was recognized by those present. Three items were donated for a raffle from Clarion Hotel and Suites Brandon, Morden’s Chocolates of Winnipeg and Metcalfe’s Garage in Treherne. The plated dinner was provided by Shelly Mom’s restaurant with the Rivers EMS and Fire Department as the servers. Alice Fast provided scrumptious desserts. All the directors put many hours into making this an amazing event and I thank them all for it. The Gala was in conjunction with the 24 hour “Giving Challenge” spearheaded by the Winnipeg Foundation. For every $5.00 that our Foundation raised The Winnipeg Foundation and the Province of Manitoba would stretch that amount by adding another dollar each. We received 24 gifts in the amount of $15,107.19 towards the Endow Manitoba Challenge. This meant our gifts were stretched by $4,000. ($2,000 by The Wpg Fdn and $2,000 by the Province of Manitoba). This means that $19,107.09 went into our unrestricted fund. These funds are the cornerstone of community foundations as they enable the board to provide grants to the community in areas of the greatest need. The other two funds that we look after, The Leonard and Gladys Burt Family Fund and the Society of Friends of Rivers Collegiate continue to receive gifts throughout the year, as well as donations for the endowment fund and In Memorium gifts. SENSUS accounting continues to be our firm for our audit purposes and Leech Printing continues to provide website & domain listing services. Information is also placed on our homepage on the Endow Manitoba website which is cared for by the Winnipeg Foundation. In the last eight years the Foundation has granted over $122,000.00 to 30 different groups, for the future of our growing community & area. Many projects have moved along because of the Foundation and its work. We continue to increase our visibility and work on moving our community forward. Thank you to all the directors for their hard work and dedication during the year for we would not have as strong a Foundation without all of you volunteering your time. Merry Christmas and Best wishes for a Happy and Healthy 2018. Thank you to everyone for attending the Annual General Meeting of the Rivers and Area Community Foundation Inc. on this blustery night. In 2016 we continued with the two strategic priorities we had set in June of 2014 which was the completion of a Public Daycare Facility and the Science Education – Wetland Centre of Excellence Project. We continued the Challenge from The Thomas Sill Foundation wherein they would provide us with a matching dollar for every two dollars we raised. May saw Ken Fosty of Tree Canada come out from Winnipeg to look at mortality rates for the seedlings planted last year and he was thrilled to see how well they had done. They like the soil conditions we have here and are native to the area. In June the Rivers Collegiate was awarded a National Award for Youth in Conservation by the Canadian Wildlife Federation and at the end of June a representative from the Collegiate went to Toronto for the national event to accept the award. There have also been many articles written about the Wetland Centre of Excellence including one in “Canadian Wildlife”. July saw the partnership and collaboration between the Foundation and the Rivers Train Station take shape as the Burns Foundation $50,000 grant and donated monies were used to repair the roof of the Rivers Train Station, the eventual home of the Foundation. This was an exciting time for all, as the reason the community of Rivers exists is because of the railway pushing west. September 16th saw the end of the Thomas Sill challenge and we learned we would not be able to count the Burns Foundation grant in that challenge. We did manage to get over the maximum amount needed for the grant and received a cheque from Thomas Sill Foundation in the amount of $5,744.00 for our endowment (unrestricted) fund. On September 23rd the Foundation took part in a “little leaf lilac shrub planting” with the rest of the community in the Rivers Train Station Restoration Committee’s Loco-Labyrinth and RV Park project. There were 250 adults and students in attendance with our MP and MLA as well as the National President (Raymond Carriere) for Communities in Bloom from Montreal. Mr. Carriere was also given a tour of the community and the Wetland Centre of Excellence. At the same time year 2 of a grant application in 2014 by the Foundation to Tree Canada to obtain seedlings for our community, came to fruition where over 92,000 more seedlings were planted by Ken Fosty and his First Nations tree planters. In October we saw our annual grant review and decision making meetings take place. This year we received grant application requests exceeding $34,000.00 for the 2015-2016 granting period. We decided to do something different then our usual granting evening and a publicity committee of Donna Falkevitch, Diane Marriott, Michelle McFadden and Al Morken (as photographer) was formed to take photos and have monthly grant stories in the local paper to show people where the grant money goes and what the project is about. The website will also be refreshed as we head into 2017. Further discussion took place about the “visibility” of the Foundation so it was decided that the Foundation would have a Facebook page and Donna Falkevitch would look after it. With a new Provincial Government elected all capital projects and programs were placed in a Pause Position until the end of December. This impacts both our strategic projects but in particular our Public Daycare Project and we have consulted with our local MLA on the situation as well as writing to the Premier showing our support for this much needed project. On October 21st and 22nd, Directors Michelle McFadden and Donna Morken attended the Community Foundations regional Meeting in Winnipeg with the largest amount of Community Foundations together ever. It was a very interesting event and lots of good ideas and information was shared by not only the CFC personnel and the Wpg Fdn but those members who make up the representatives of the attending Foundations. Endow Manitoba begins every November and this year was no exception. On the 19th of November our Foundation once again participated in a 24 hour “Giving Challenge” that was spearheaded by the Winnipeg Foundation. For every $5.00 that our Foundation raised The Winnipeg Foundation would stretch that amount by adding another dollar. The Foundation advertised on radio and local newspaper as well as on our Facebook page about the now “annual” challenge. We received 12 gifts in the amount of $1,825.00 towards the Wpg. Fdn Challenge. This meant our gifts were stretched by $365.00 totaling $2,190.00 for our community unrestricted fund. These funds are the cornerstone of community foundations as they enable the board to provide grants to the community in areas of the greatest need. In December we learned that the Richardson Foundation grant application was unsuccessful and so further discussion will need to take place to determine what further avenues we will explore to get the much needed outdoor classroom completed. The two funds that we look after, The Leonard and Gladys Burt Family Fund and the Society of Friends of Rivers Collegiate continue to receive gifts throughout the year, as well as donations for the Train Station Restoration and In Memorium gifts. SENSUS accounting continues to be our firm for our audit purposes and Leech Printing provides website & domain listing services. Information is also placed on our homepage on the Endow Manitoba website which is cared for by the Winnipeg Foundation. In the last seven years the Foundation has granted approximately $93,464.09 to the future of our growing community and area. Many projects have moved along because of the Foundation and its work. We are currently working on new partnerships and projects to continue to move our Foundation forward and increase our visibility. I look forward to seeing them come to fruition in the coming years. 2017 will be an exciting year for us as we celebrate Canada’s 150th Birthday! Merry Christmas and Best wishes for a Happy and Healthy 2017. Thank you to everyone for attending the Annual General Meeting of the Rivers and Area Community Foundation Inc. In 2015 we continued with the two strategic priorities we had set in June of 2014 which was the completion of a Public Daycare Facility and the Science Education – Wetland Centre of Excellence Project. We accepted the Challenge from The Thomas Sill Foundation wherein they will provide us with a matching dollar for every two dollars we raise. One thousand dollars was provided by the Thomas Sill Foundation for advertising of this challenge. We have 18 months, until September of 2016 to strengthen our gifts to our Foundation. Whatever gifts are given in that time, Thomas Sill Foundation will match to a maximum of $25,000.00. March – May We met with the Riverdale Day Care Inc. and asked what further we could assist them with in realizing their goal, as well as that of the community. It was determined through discussion we would assist them by writing a letter to the Public School Finance Board showing our support for this much needed project. Further that any other leadership and grant opportunities would be assisted with where possible. A letter was written by the board to the Manitoba Public School Finance Board but as of this date no reply was ever received by the Board. However, great news was received later in the year as this report unfolds. The promotion of the Wetland Centre of Excellence was further enhanced by the Foundation application to the Richardson Foundation for $150,000 to build an outdoor classroom at the Wetland. This was submitted through the local Richardson Pioneer Elevator Manager, Kim Warburton. The classroom is very much needed for the science education material that is delivered by both schools and will be used by the general public as well. Various media relations projects were undertaken via print, website and radio. This continues until we have the whole project area completed. We are still waiting to hear from the Richardson Foundation on our application. As a result of a grant application in 2014 by the Foundation to Tree Canada to obtain seedlings for our community, we found out that we would be receiving over 93,000 seedlings. In May we saw Ken Fosty and 15 Aboriginal Tree Planters come to our Community and plant over 93,000 jack pine seedlings in the Millennium Park including around the Wetland Area. July saw 5 local couples celebrate their 35th wedding anniversary and donate the monies received from that celebration to the Foundation. Thank you to all of them for thinking of us. All these gifts for our foundation go towards the permanent endowment, the Thomas Sill challenge and making our community a better place. Over the summer one of our original directors Sarah McLeod gave us a letter advising that she would be retiring from the Foundation and so we began the process of finding another director for her position. On the 30th of September we held a media event to recognize Tree Canada and co-sponsor CN for their contribution to our green spaces. It was also at that time that Ducks Unlimited presented the Rivers Collegiate with a plaque recognizing their work with the Wetland Centre of Excellence. In October we saw our annual grant review and decision making evenings take place. This year we received grant application requests exceeding $100,000.00 for the 2014-2015 granting period. After work by the nomination committee, Stacey Stott accepted the opportunity to become a director on the Rivers and Area Community Foundation Board replacing out going member Sarah McLeod. Sarah was thanked for all her time and contributions to our growing Foundation. Endow Manitoba begins every November and this year was no exception. On the 14th of November our Foundation once again participated in a 24 hour “Giving Challenge” that was spearheaded by the Winnipeg Foundation. For every $5.00 that our Foundation raised The Winnipeg Foundation would stretch that amount by adding another dollar. The Foundation took out a large colored advertisement in The Banner explaining both the Winnipeg Foundation challenge as well as the Thomas Sill Challenge. We were very fortunate to receive gifts in the amount of $2,200 towards the Wpg. Fdn Challenge. This meant our gifts were stretched by $440.00 totaling $2640.00 for our community unrestricted fund. These funds are the cornerstone of community foundations as they enable the board to provide grants to the community in areas of the greatest need. The two funds that we look after, The Leonard and Gladys Burt Family Fund and the Society of Friends of Rivers Collegiate continue to grow with interest and gifts throughout the year. SENSUS accounting is used for our audit purposes and Innovative Media Group to provide website service. Information is also placed on our homepage on the website of the Winnipeg Foundation. Thank you to Craig Allison for his powerpoint abilities and Al Morken for all the photos he takes. In the last six years the Foundation has granted approximately $79,000.00 to the future of our growing community & area. We are currently working on new partnerships and projects to continue to move our Foundation forward, increase our visibility and I look forward to seeing them come to fruition in the coming years. Welcome Stacey as a director on our Foundation. Thank you to all the directors for their hard work and dedication during the year for we would not have as strong a Foundation without all of you volunteering your time. Merry Christmas and Best wishes for a Happy and Healthy 2016. Thank you to everyone for attending the Annual General Meeting of the Rivers and Area Community Foundation Inc. In 2013/2014 we began more strategic thinking about ways in which we could get out the message about our Community Foundation and community Foundations in general. We discussed that the Credit Unions are much like Foundations in that they work in communities and put back into them as well. So I am very proud to say that after a discussion with all of the directors, Michelle McFadden came up with the idea to ask Westoba Credit Union if they would let us have one page of their annual calendar to make people more aware of the good work that our Foundation does in the community. The end result is the calendar that came out this year. What an amazing collaboration & awareness project this has been, both for the Foundations and the projects that the Westoba Credit Union has supported! A copy of this calendar along with a letter has been sent to the Governor General to show him that we took his words to heart about being a “smart and caring community” as well as to Credit Union Central for Canada and Manitoba. In June of this year, consultant Kim Bater with the Community Foundations of Canada, came to Rivers and presented a workshop specifically for the RACF directors. He presented an overview of the CFC, spoke on Governance and then strategic planning. He looked at solidifying Strategic Initiative projects within our community. Several were identified but the top two were noted as the Riverdale Daycare Project and the Wetlands Centre of Excellence. We will assist them in whatever manner we can to see their project completed for the needs of the community. In September we were represented by myself and director Al Morken at the annual Provincial Community Foundation Mtg in Selkirk where all community foundations are invited to attend to discuss with the Community Foundation of Canada what issues or programs are in the forefront. It is always a very important meeting for us as we continue to learn what our role as a Community Foundation is in building our community and area. October saw our annual grant review and decision making evenings take place. This year we received grant application requests exceeding $96,000.00 for the 2013-2014 granting period. November 4th Brandon and Area Community Foundation held a Needs Assessment Session where director Craig Allison and I attended, with other surrounding Foundations. The projects were varied and when we did a very quick calculation the projects were valued at over $15 million that is before all the volunteer labour and in kind materials begin. So as you can see Foundations are very important in the development of our communities with strategic initiatives for development. Endow Manitoba begins every November and on the 13th of November our Foundation was invited to participate in a 24-hour “Giving Challenge” that was spearheaded by the Winnipeg Foundation. For every $5.00 that our Foundation raised The Winnipeg Foundation would stretch that amount by adding another dollar. We were very fortunate to raise $1,380.00 that was stretched by a grant of $276.00 totaling $1,656.00 for our community unrestricted fund. These funds are the cornerstone of community foundations as they enable the board to provide grants to the community in areas of the greatest need. 4 days later on the 19th of November we celebrated our 5th Anniversary. The evening was made special by the theme of snowflakes and snowmen. Just as no two snowflakes are alike, no two grant applications are the same. Board members on the granting committee work hard to go through all the applications to make sure all requests have the required criteria and then recommend their decisions to all the board for final decisions on grants. This year we were able to provide over $21,020.24 worth of grants with the help of the Brandon Area Community Foundation through a grant request by our Foundation. Having applied for a grant to the BACF to assist in the building of the Outdoor classroom at the Wetlands we were awarded a grant of $10,000.00 which then flows through our Foundation to the Wetlands classroom project. We wish to thank BACF for their collaboration with us on this exciting project and that brought our total granting to $21,020.24. The Power Point presentation that was presented on that evening was courtesy of Director Craig Allison and his computer wizardry. Some of the photos supplied were by Director Al Morken. That presentation highlighted the projects we have supported over the last 5 years and the previous collaboration(s) with the BACF. We continue to use SENSUS accounting for our audit purposes and Innovative Media Group to provide website service. Information is also placed on our homepage on the website of the Winnipeg Foundation. In the last five years the Foundation has granted approximately $68,000.00 to the future of our growing community & area. We are currently working on new partnerships and projects to continue to move our Foundation forward, increase our visibility and I look forward to seeing them come to fruition in the coming years. Thank you to the board for all their hard work during the year for we would not have as strong a Foundation without you. Merry Christmas and Best wishes for a Happy and Healthy 2015. Thank you to everyone for braving the cold and attending the Annual General Meeting of the Rivers and Area Community Foundation Inc. In 2013 we moved forward in increasing our visibility and receiving new funds. This year saw us add to our physical assets and marketing with the addition of two signs and a display for use at different functions within our community & area. Our website provides challenges from time to time but we seem to get those solved with technical advice from our provider. We continue to use SENSUS Accounting firm to audit our books, complete our Income Tax and meet our financial reporting requirements to the Canada Revenue Agency. In May our Foundation was invited to attend the Canada Starts Now Seminar with VIA Rail, CBC and the Community Foundations of Canada to begin thinking about celebrating Canada’s 150th by developing our communities. At the beginning of June we attended the National Community Foundations of Canada Conference in Winnipeg which was an amazing event. It was hosted by The Winnipeg Foundation and featured His Excellency Governor General David Johnston as the principal guest speaker. He encouraged all of us to make our communities, “Smart and Caring.” To recognize that “You make your community and your community makes You” as a step in letting everyone know how important Foundations are and the work that they do in developing communities. We need to be sure that we tell “our story”. That sentiment started the beginnings of a new Family fund for our Foundation and the precursor for another family Fund with the North Norfolk – MacGregor Foundation. July saw many firsts for us, our first float in the Summer Parade, our first display set up at the Town of Rivers 100th Anniversary Celebrations , and our first anonymous donation through the Westoba Credit Union. Another first was that Kathy Mercredi (Plaseski) wrote some powerful words as she looked at the display. Her thoughtful words written on a card “We have all travelled afar…but Rivers is always the Foundation we come home to” is Great Inspiration! September saw us with our display at Crafty to continue promoting ourselves to our community and area. In November for the first time, our annual granting evening was held in the Behlen Curling Lounge in our new multi-use facility. Not only did we grant $11,000.00 to 9 different recipients for their projects but some of the members of the Leonard and Gladys Burt Family began a legacy in their name with the establishment of “The Leonard and Gladys Burt Family Fund”. We made history by becoming the first Community Foundation in Manitoba to provide a grant to the Heart and Stroke Foundation (Manitoba) for the procurement and training of an AED for a public place within our granting area. It will be placed at the Rapid City Golf Course. In the last four years the Foundation has granted approximately $48,000.00 to the future of our growing community & area. We are currently working on new partnerships and projects to continue to move our Foundation forward and I look forward to seeing them come to fruition. Our Foundation had many “firsts” this year and without the directors providing their time, vision, leadership and hard work we could not keep moving forward. 2014 promises to be an exciting year as we celebrate our 5th Anniversary. Merry Christmas and Best wishes to all. I would like to take this opportunity to welcome everyone to the first Annual General Meeting of the Rivers and Area Community Foundation Inc. We have come a long way since receiving our official charitable status in 2009 and in 2012 we continue to move forward in providing investment for the future of our community and area. This year saw us increase our administrative assets with the addition of a filing cabinet and lap top for all our records. After research and discussion the Board of Directors engaged SENSUS Accounting firm to audit our books, complete our Income Tax and look after our financial reporting requirements to the Canada Revenue Agency. It should also be mentioned that we look after the Friends of Rivers Collegiate Scholarship Fund and in 2012 their first official scholarship under the Rivers and Area Community Foundation was presented. While The Winnipeg Foundation looks after the investment of the fund as requested by their members, it sits under the RACF umbrella. At the end of May we said farewell to our treasurer and fellow director Lorna Short as she moved to British Columbia. We thanked Lorna for her time as our treasurer and completing the necessary reports. We wished her success in her new endeavors. Having a spot to fill on the executive as treasurer, director Craig Allison rose to the challenge and we thank him for doing so. With the first meeting with our accounting firm we were able to use technology to assure all those around the board room table could see the financial pages we were discussing. There was a director position left vacant and in October we welcomed Diane Marriott as a new director on the Rivers and Area Community Foundation Board of Directors. As November is Endow Manitoba month and time for our granting event, The Directors decided that we would try to increase awareness for the Foundation. This would take place by enhancing our Granting Evening with local musical talent and great desserts! Unfortunately I was unable to be here for the entertaining evening but everyone pitched in to make it a memorable event. Directors Michelle McFadden and Craig Allison showed off their culinary skills for the desserts, while Vice President Ian Dyer and Director Brian Carlisle were the MC’S for the evening. A total of $9,369.74 was granted to 9 different community groups for their projects from the Rivers Kids Club for new educational and play materials, the Prairie Crocus Regional Library for their equipment upgrades, to the Rivers Elementary School and Healthy Rivers Area Project for community gardens. In the last three years the Foundation has granted approximately $37,000.00 to the future of our growing community. I would like to take this opportunity to thank all the directors for their time, vision, leadership and hard work to keep this community and foundation moving forward. Bernard and Iola Goekoop would be proud of what their legacy is accomplishing. 2013 promises to be an exciting year and I look forward to working with everyone in making new history.